I participated in an Influencer Activation on behalf of Mom Central Consulting for Aveeno. I received product samples to facilitate my review and a promotional item to thank me for participating. All opinions are 100% my own and may differ from yours. I will only endorse companies, products and services that I believe, based on my own experiences, are worthy of endorsement. I’m a very competitive person and I don’t walk away from challenges easily. Recently I was asked to take the #AveenoDailyChallenge. My challenge was to start one healthy challenge and stick with it for 21 days. I was to also use Aveeno Daily Moisturizing Lotion every day. Did you know it takes three weeks to develop a habit? 21 days. That’s it 21 days to change your lifestyle. 21 days to a healthier you. Three weeks of doing something every single day isn’t hard. Yet, three weeks is very hard. Especially when the thing I had to do for 21 days was sleep 8-hours a night. Me, the woman who is lucky to get 6-hours sleep a night. I can tell you that using the Aveeno Daily Moisturizer was easy. One of the best challenges I’ve ever taken. After this long, cold winter, my dry skin was in desperate need of attention. 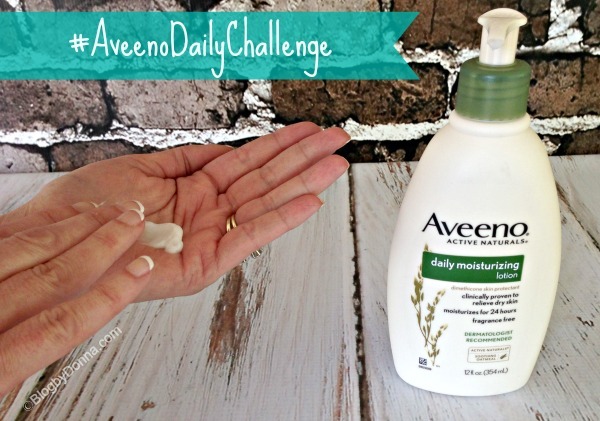 I applied the Aveeono Daily Moisturizer on my skin every morning after my shower (and sometimes at night before going to bed) and my skin stayed soft and supple all day long. 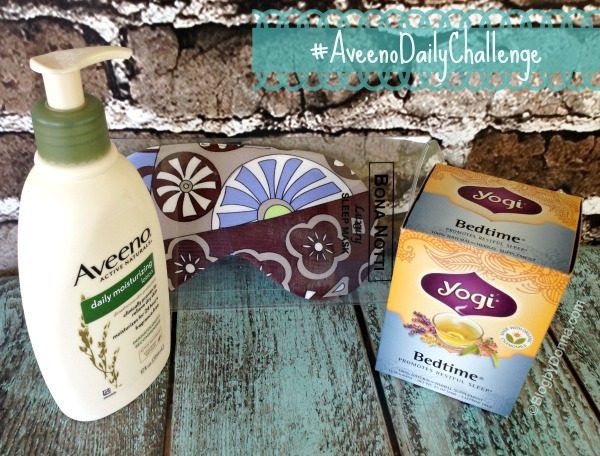 Moisturizing my skin daily with Aveeno was the easy part of my three week challenge. Sleeping 8-hours a night is the optimal amount of time… and something I rarely achieve. Even as a child my Mom said I never seemed to need a lot of sleep. I know as a teen and in my early twenties, getting 5 hours of sleep (and pulling all-nighters) was fairly routine for me. There was always too much to do, to sleep. And that hasn’t changed much now that I’m *cough* fifty *cough*. The difference over the last few years is that I really need and want 8-hours of sleep, but it just rarely happens. It’s not that I have trouble falling asleep, but it’s staying asleep. Or I wake up really early and just go ahead and get up… thinking I have things I need to get done. I’ve realized on the journey, this path of more sleep is that I have to let go of the idea I have too much to do. I have to prioritize better, and be alright with letting things go. Of course I have deadlines that have to be met. And obligations to fulfill. But I need to schedule things and as I said, “prioritize”. I’ve also learned that multi-tasking is not my friend. In fact, “multi-tasking” is a bad word. In my life anyway. See, what I discovered during the last 21 days is that I try to do several things at one time, but not giving my best to any of them. This is hard to admit, believe me, but it’s true. Now that the 21 days have come and passed, I am at the place where I will be able to get more sleep. I’ve changed my way of thinking about it. My getting an extra hour or so of sleep is not going to keep me from doing what needs to be done. Because I’m going to prioritize and schedule better. My sleep and my health are too important to me and my family. Am I getting 8-hours of sleep each night? No. I can count on one hand how many times I got 8 or more hours of sleep in the last three weeks. Five nights exactly. I felt so refreshed, too. I know that is what I’m working towards. Thankfully I am getting around 7 hours of sleep most nights now, which is a big improvement, I assure you. I’m sure once school is out and we don’t have to get up so early, I’ll be getting 8 hours a night. As an added benefit of using the Aveeno Daily Moisturizer is that my skin is feeling and looking healthier, too. I am so thankful to be an Aveeno Daily Moisturizing Lotion ambassador and to be featured on the Aveeno Facebook page. Please check out all the other fabulous women who took the #AveenoDailyChallenge with me and see their journeys to a healthier lifestyle. Whether it’s getting more sleep, drinking more water, exercising more, eating healthier, or being less stressed, what is one thing you need to do to live a healthier YOU? I need to learn how to be efficient with my time. I’m such a flitter that I end up wasting way too much time. I use Aveeno lotions all the time. I need to do all of those! I feel like I’m pulling a part at the seams these days. I love Aveeno. I have been drinking more water the last three weeks. That is awesome that you are getting more sleep (I so need to get more! ), and that your skin is feeling better too! I need to make all of those lifestyle changes, but I’m starting with more water to be healthier. What a great challenge idea! I never get 8 hours consistently, but I know I need it. Happy to be joining you on this challenge & glad to see it’s going successfully for you! I am going to pick some of this up for our summer trip, it is the only thing that keeps out skin from drying out. Yes, that was such a fun campaign! I’ve learned so much about myself. I have such dry skin that I have to lotion right after the shower when I am still damp. Aveeno makes great products and definitely looks like it’s been helping make you a healthier you! Such a great campaign. I’ve learned so much as well. hey, so interesting. Aveeno and ur sleep story. of course enough sleep help the skin as much as a good moisturizer. it is so important and effective in health issues. hope u get better with ur sleep hours. I need to drink more water. Thanks for the motivation. My hands could use some help after this winter as well. I eed to spend more time by myself, taking time to unwind. I really need to use this everyday. I try but it’s not a habit for me yet. I need more sleep. I am playing catch up this week since we are having a lot of rain. Yes, multi-tasking is overrated. Sometimes it is necessary though.